When the Police took the stage at Dodger Stadium on Saturday night (June 23, 2007), it admittedly took me a bit to realize it really was Sting, Stewart Copeland and Andy Summers playing. It has been so long since I had seen the band (I caught them at Hollywood Park in the early 1980s during the trio's "Synchronicity" tour), it kind of floored me for a minute. Then I decided to squash the rock critic inside me and just enjoy the two-hour ride. Indeed, I had read reviews online over the past month or so noting how many of the band's great songs had been revamped and boasted new arrangements now. That was definitely true, with songs such as "Don't Stand So Close to Me" and an especially beautiful version of "Wrapped Around Your Finger" boasting different tempos and the hit "Roxanne" getting extended. But the power of the songs, and the unique sound and chemistry of the band was quickly apparent. Highlights included the aforementioned "Wrapped Around Your Finger" and "Roxanne," as well as a stunning "King of Pain," rocking "Synchronicity II" and straight-forward "Message in a Bottle." All three musicians played with confidence and precision throughout the night, and the set list featured the majority of the Police's best-known songs ("So Lonely," "Every Breath You Take," the night-ending "Next to You"). It really was an amazing night and my hope is the performance makes it to DVD. And soon. I have such great memories of the Police set, but I admit to being very disappointed at the Foo Fighters. Although Dave Grohl & company have released a number of strong singles, in concert Grohl ruined just about every song with needless screaming. He is a fine singer, but for whatever reason (maybe to compete with the '00s metalcore bands) he would yell over and over. Even "Learn to Fly" and "Everlong" were bludgeoned to death. Ouch! Orange County’s far-flung music scene has launched the successful careers of punk, pop, ska, blues and even country artists, but the burgeoning success of singer-songwriter Tyrone Wells draws few obvious ties with those movements. The long-time Fullerton resident (who recently moved to Chino Hills) impeccably blends pop, rock, soul and blues with R&B across his latest album. Songs such as the folk rocker "Need," gospel-tinged rocker “What Are We Fighting For?” and melodic ballad “Sea Breeze” are among the many highlights on “Hold On,” his first-ever album released by a major label (Universal Republic). Wells has seemingly been on a non-stop tour since the release of the 12-song set on Feb. 6, but he was in town earlier this month to perform two special benefit acoustic shows at the Plush Café for six-year-old CHOC patient Bailey Spoonhower. Wells returns home this weekend to perform a proper homecoming show with his full band at the House of Blues in Anaheim on June 23. “I came here and went to Hope International University; it’s a little private school right across the street from Cal State Fullerton,” Wells said of the move from his native Spokane, Washington to Fullerton. Wells is armed with a powerful voice, and uses that in the service of songs that mingle the singer-songwriter instincts of James Taylor with the soulful approach of Stevie Wonder. His distinctive and affecting voice is capable of tackling a variety of styles, and he is as comfortable playing alone with his acoustic guitar as he is backed by a full band. And that gift of writing, performing and entertaining came despite an admittedly conservative upbringing where the young son of a preacher was only exposed to gospel music. Wells established a strong following in Orange County before being signed, performing frequently at coffeehouses such as Fullerton’s McClain’s and the Plush Café. He also released several independent CDs, including “Snapshot” (2003) and “Live at McClain’s” (2005) before going into the studio with producer Chris Karn to work on “Hold On” in late 2005. “I was basically just doing my own thing for about five or six years and had never talked to a major label,” Wells admitted. Wells, Kalai and Ernie Halter perform at House of Blues, 1530 S. Disneyland Dr., Anaheim, at 8 p.m. on June 23. For more information on that show, visit www.tyronewells.com. To hear several full-length songs from Wells’ latest album “Hold On,” visit www.myspace.com/tyronewells. Since I last checked in here, I've been anything but idle. Just a couple of weeks after spending three days in Indio at Coachella, I got to cover the 2-day Doheny Blues Festival in Dana Point. 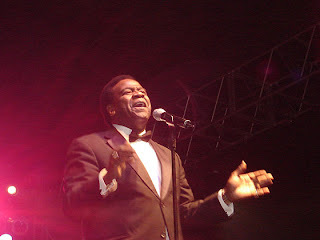 Day one (May 19, 2007) was capped off by an amazing set from Al Green (seen here in one of my favorite pics I shot that night). I had never seen the legendary singer before and it was a joy. Armed with a voice and engaging stage presence that thrill, the singer effortlessly sang many of his biggest hits with a warmth and enthusiasm that played out like he was the new kid on the block. In addition, the artists that performed in the hours leading up to Al Green also turned in fine sets, including a rejuvenated Fabulous Thunderbirds and an act that blew me away, Rhythm Council. Pianist-vocalist Henry Butler, guitarist-vocalist Papa Mali, sousaphone player Kirk Joseph and drummer Robb Kidd somehow fused New Orleans jazz, funk, Delta blues and Southern rock together across Rhythm Council's memorable 38-minute, 3-song set. Susan Tedeschi is one of the formidable young talents hoping to continue to champion blues in the 21st century. Her powerful soprano and strong rhythm and lead guitar work were used throughout her solid full-length Main Stage set. I can't say enough good things about the second day of the festival, which was staged on Sunday, May 20. Anyone who thought John Fogerty (pictured playing guitar) was going to close out the 2007 fest with a quick greatest hits set was thankfully mistaken. 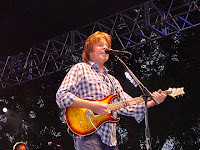 While many headliners who run the last lap in Dana Point simply plan an hour or so because the natives are restless and want to go home after enduring two full-length days in the outdoors, Fogerty and his five-man band blew the roof off the seaside, ceiling-less Main Stage on Sunday night. It was a thrill to be pressed up against the stage, watching this legend deliver an impressive set of great songs. Over the course of a 23-song concert that stretched for 97 magical minutes, Fogerty injected the kind of power and memorable music making that will undoubtedly set the bar for future performers at the Doheny Blues Fest. He expertly played rockers (the show opening "Travelin' Band," blistering "Fortunate Son"), country-tinged classics ("Bad Moon Rising," "Down on the Corner") and stirring folk rock (Who'll Stop the Rain," "Deja vu (All Over Again)," "Have You Ever Seen the Rain? ), moving around the stage with the enthusiasm to match. The first wonderful performance to hit fans on Sunday came almost eight hours before Fogerty even took the stage, thanks to a delightful pairing of Kim Wilson (lead singer and harmonica player for the Fabulous Thunderbirds) and his band (including guitar wiz Kirk Eli Fletcher) with legendary harmonica player James Cotton. The audience at the usually intimate Backpoch Stage erupted in applause and a standing ovation when Cotton joined Wilson on stage. Cotton didn't disappoint, playing his instrument with fiery skill and later trading rapid-fire harp licks with Wilson. Other highlights on Sunday included a great performance from the Blind Boys of Alabama and Steve Copeland & Raging Sun. More recently, I got the chance to catch Tyrone Wells, James Grey, Micah Dahlberg and several other acoustic performances at a benefit for Bailey Spoonhower, 6, a cancer patient at Children's Hospital of Orange County. The show was held at the Plush Cafe in Fullerton on June 3. You can read more about the performers in my Orange Pop feature column that ran in the Orange County Register today profiling Tyrone Wells. On June 9, I saw singer-songwriter Michael Ubaldini play a very good acoustic set at Alta Coffee in Newport Beach that included strong originals and a few well-worked covers. His wonderful originals included "Side By Side," "Honeysuckle Dew" and "The Unfaithful Wife."